Sway away those lazy summer days in style with your spouse or let the kids pile in, as it can safely support up to 450 pounds! You will feel like you’re floating on the clouds when you are lying on this jumbo Quilted Hammock. Made from UV resistant quilted fabric, it is not only soft and comfortable but also extremely durable. 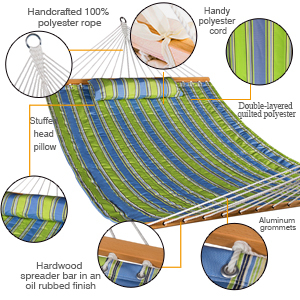 This hammock features its matched weather and fade resistant head pillow with polyethylene stuffing adding a new level of comfort to the hammock. With an "o" ring at each end of the hammock and two 13.4” long chains and two steel S hooks included, it is easy to hang either between two trees with straps or on a hammock stand(NOT INCLUDED). Don’t hesitate to take one to your garden or patio and make your resting or relaxing easier. Lazy Daze Hammocks is perfect for one or cozy for two, this Quilted Hammock provides an unique incredible and ideal place for relaxation. Rest assured knowing that your hammock will retain its look all season long. It's made from solution-dyed yarn, our uniquely patterned colors look great and will stand the test of time. It's relatively easy to find a hammock that is suitable for comfortable use by one person, but it can be a bit harder to find a hammock suitable for shared use. 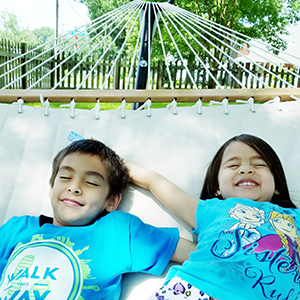 If you and your significant other want to be able to share the hammock, or if you want a hammock kids can pile into, make sure you check the rated weight capacity of a prospective hammock, as well as its width. This 15ft heavy-duty steel hammock stand will perfectly fit for this hammock. Don't hesistate to laze yourself in busy days. 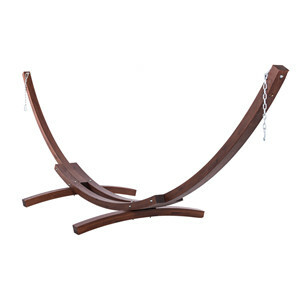 Made from Russian pine that is coated with varnish, this 14ft wooden arc hammock stand creates elegance and stability for your relaxation. 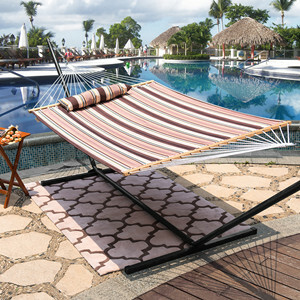 Lazy Daze Hammocks provide you with more easy and beautiful choices for hammock and stand set. We believe, in this way, everyone will have his/her favorite. Very satisfied with product. Color looks like picture! Very comfortable! I LOVE LOVE LOVE this hammock. The material is sturdy and comfortable. It is nice and wide, easily fit two people. Better that expected. Nice quality and could be reversible because it's quilted on both side. bought this as a birthday gift for my husband, he loves it! I bought this hammock for my husband who is a big guy...about 6'5". It has worked out wonderful! Very good quality and very spacious.